Colorado Youth for a Change and the National League of Cities’ Reengagement Network lead this session on reengagement practices. This plenary session shares the healing centered engagement framework with the Opportunity Youth Forum Network. This session of funder partners represents diverse approaches to grant making, including leaders from national and local philanthropies. Aspen Institute CEO and President Dan Porterfield opens up the convening with a talk about leading with an equity and justice lens. 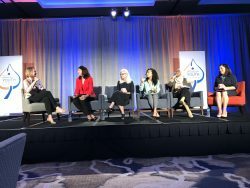 Looks at 12 best practices across the talent pipeline from recruitment to retention and advancement for Opportunity Youth. Panelists discuss the importance of culture, community organizing, and values such as mutuality in the fight for justice. Dismantling barriers to social mobility discussion at Aspen Ideas Festival with NAACP president Derrick Johnson. The closing plenary session brought together leaders of efforts to disrupt poverty. This video details shared lessons in deepening a commitment to using data for both equity and impact.